With a double bill of both Stanley Clarke and The Headhunters it's little wonder that the Royal Festival Hall was packed to the rafters. The evening effectively put two headline acts right next to each other. This might have been an issue for lesser bands, but such titans of '70s jazz fusion can still very much put on a show. The Headhunters, with original members Bill Summers on percussion and Mike Clark on drums, possessed the energy and creativity exhibited on seminal albums such as Head Hunters, Survival Of The Fittest and Thrust. Stanley Clarke and his versatile young band wowed the audience with bass excellence and an exciting, fresh performance. Clarke's approach to bass playing is, and always has been, revolutionary. His bio talks about how Clarke "liberated" the bass from the back of the stage. Alternating between electric and upright bass, Clarke exhibited his technical and musical mastery. His opening solo on double bass explored finger-style techniques and ended with the impressive upright slap style that he has perfected over the years. On No Mystery he brought the song to a close with an immense solo of extremely dexterous runs, flying up and down the finger board in dramatic fashion. Although Clarke is known for pushing the bass to the front of the stage the focus of this show also demonstrated his passion for shinning a light on the up and coming talent within the ranks of his band. Extended and increasingly virtuosic solos were given out to every member of the group, often ending in impassioned duelling between two or more musicians. One of the standout players was undoubtably Salar Nader on tabla. Taking exceedingly fast and intricate solos, often vocalising them through his microphone, both his band mates and the audience were noticeably astonished by the technical excellence he exhibited. Shariq Tucker on drums skilfully laid down the groove locking in with Clarke, yet his volcanic solos brilliantly erupted whenever he got the chance. Cameron Graves did stellar work on keyboards, his feature on Black Narcissus, with its fast flowing scalic lines growing out of repeated rhythmic sections, was energetic and exciting. Beka Gochiashvili, on piano and keyboards, produced complex, explosive solo’s growing in intensity. Electric violinist Evan Garr delivered what I can honestly say are some of the most rock and roll violin solos I have ever heard, jumping and bending to the music in excitement, on Clarke’s ridiculously funky version of Goodbye Porkpie Hat. The evening was kicked off by fusion super-group The Headhunters. Slipping into effortless grooves and supremely tight unison passages filled with hits, the band didn’t pull any punches or give themselves an easy ride. Tunes like Actual Proof exhibited their musical prowess, the kit and percussion blending seamlessly together to create a complex but perfectly synchronised beat, whereas Butterfly showed off the band’s range, with a sultry saxophone solo atop a smouldering groove. Watermelon Man was a clear highlight of the set with people whooping at the intro and clapping along. To see two of the biggest '70s jazz fusion names in one concert is a lot to take in. However, despite the eminence of the artists there was no stuffiness on stage and the audience’s attitude reflected this. The encore saw both bands performing together, with solos from all involved, Clarke got everybody on their feet dancing, singing and cheering, it was something to witness in a hall of that size. Many decades on from when it started, one thing is clear, the spirit of jazz fusion is alive and kicking. I met him outside, he was a humble man then. Wednesday night’s gig was awesome, as your excellent review said, what amazing talent, the young guys with Stanley were just superb, then having both bands come together for the encore was just perfect ,people sharing their love and creativity, not one ego in sight! "Packed to the rafters," you say. Just to put the record straight for history, I was in the 'rear stalls' at the concert, and there were many rows of empty seats behind us, and empty seats around us too. In fact, my mate and I commented in surprise at the minimal take-up in our area. Excellent concert, though, although, in my view, Clarke's band were just too cerebral to get into. Agree - maybe three quarters full. And also, about an hour and 10 minutes of the main act I thought was pretty ropey value for the price of the tickets .... and only a few hits (people, you could tell, wanted to hear School Days!). What they played was utterly brilliant, but I can't help feeling that I was a little short changed by Mr Clarke, who is still the main man on bass. 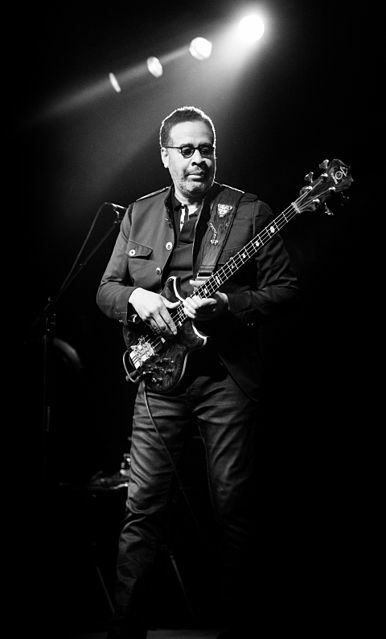 When Stanley Clarke talks about liberating the bass he is less than generous. When Back Door played their first London date ,a week at Ronnie's opposite Clarke with Return to Forever it is well known that he was blown away by Colin Hodgkinson's revolutionary technique in the pianoless trio, providing harmonic as wwell as rhythmic propulsion. Later Jan Hammer took Hodgkinson over to the US where they toured for about a year. When Colin tried to revive Back Door a few years back hardly anyone wanted to know with much muttering about them being 'dated' So much for the glorious new upsurge in jazz interest. For the first time, I listened to Stanley's live performance at the Istanbul Open Theater in 1991, and "my ears!" fell in love with creative techniques by his bass guitar playing!!! !